I wonder if some of us are missing something deeply significant? 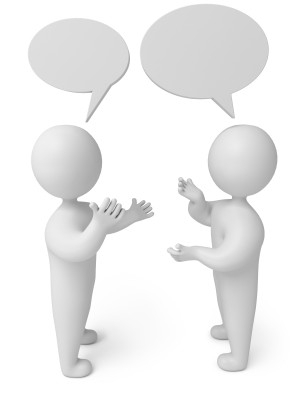 Preaching involves spoken communication, but what is that spoken communication? Is it a tool we use to transfer the information that we need to get across? Or is it profoundly more than that? I’ve heard preachers who preach as if their speaking is about the information transfer, but little more. So that sense of personal detachment, or coldness, or distance . . . is that just a matter of poor delivery, or is there something more going on? 1. The Bible doesn’t treat human speech as just a tool. There is a massive emphasis on hearing God’s Word. Our response to what we hear defines us. Our integrity of action to what we confess is critical. The tongue is a powerful organ in the body. 2. The Bible is a story of “did God say?” The serpent offered humanity an autonomous alternative to trusting dependence on God. We can be our own gods. Why would we want that? Because of a distrust in God’s spoken word, which is a distrust of His gracious character. Ever since then the hiss of the lie has been an ever-present. And the question has always been, who will trust the word of God’s promise? 3. The Bible presents us with a God who speaks. Why don’t we see more from heaven? We can’t fathom that perhaps our eyes are not the senior sense. We fell by distrust of speech, we are invited to trust based on God’s Word (and He even made His Word visible to us in a Person!) But this isn’t some pragmatic condescension of God for our sake, He is eternally a speaking God. What constitutes the reality of the Trinity? We would do well to let go a little of a metaphysical conversation of substance, and ponder more the biblical revelation of a God in eternal communion. 4. The Bible seems to see speech as central to what it is to be a person. Now we’re probing a bit more. For centuries we’ve been caught up in the idea of personhood as being about rationality, will-power and individualism. We’ve seen it as an issue of separation, of hierarchy, of a will to power. What if what we are is not best defined by our CV/resume (skills, capacities, education, even references from the most impressive people we know)? What if what we are is defined by who we have true relationship with? We inherently sense that reality, but our world denies it. And what if relationship is, at its core, a matter of speaking and hearing, of a mutual indwelling through communication? Okay, enough for today, but here’s the thought I’m nudging us toward. What if preaching is profoundly more about speech than we’ve ever realised? Our God is a God who speaks. A God who has spoken. And at the centre of Christianity is our heart response to what He says? I think the key issue is to be sure to make things clear – more than that, make Christ clear. Comparing one place with another is an aspect of preparing for eternity, but it can be abused by both speaker and listener alike. After all, we can justify and rationalize ignoring a place or accepting a negative. What’s more when the focus is on the listener, they are prone to feel justified in comparison to others. But if the focus is on Christ, then we feel both convicted and drawn, hopefully, to Him. Thinking through Christ’s example with the woman at the well, he spoke with an openness and clarity (as opposed to the reserve shown with religious expert Nicodemus). I wouldn’t try to impress them, but to offer them Christ and invite them to relate with him. Clear, simple, direct, relevant, uncomplicated and personal…that would be the recipe for handling the text well so as to offer the Word incarnate to these folks. Other thoughts welcome, of course. Since communication is central to relationships it is, in my mind and experience, at the centre of what it is to be a Christian. This begins with my own time with the Lord and is magnified when I share it with at least one other person or even a whole congregation. It is a life of sharing the overflow of what we have received, the love of God in Christ Jesus. He is my life. Thank you for the post. Thanks Mikael – I appreciate your comment.